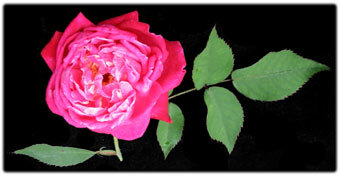 This crimson rose is also known as the "CrackerRose". By either name it is a common sight throughout the Southeast. The flowers of Louis Philippe are deliciously scented and are great to use in the kitchen for rose syrups, rose water or just as a cut flower. We have often cut bouquets of this reliable rose for our Christmas centerpiece, as it yields flowers continuously. When visiting our nursery for the first time we always recommend beginning your rose collection with a China class rose. Louis Philippe is at the top of our list due to the ease with which it grows.